I'll post this as fast as I can before I head off to work. I hope the full article will be translated soon. ^^ A very thoughtful Leader, that is what Hyun Joong is! 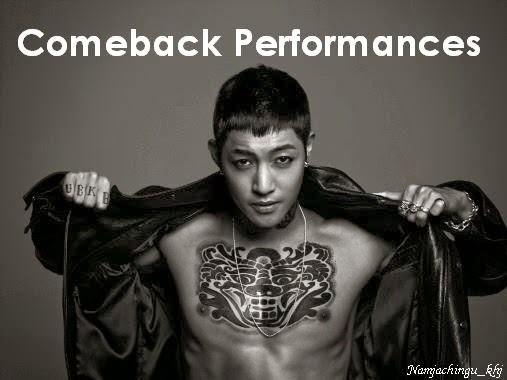 ♥ 김현중 사랑해!! ♥ Credits goes to all who translated. Thank you! (The incident) happened around 2 years and a half ago during my first album promotion 'Break Down'. Although it seems hilarious now but it was really serious back then that I nearly lost my conscious inside the ambulance. My vision turned white and foams started to form in my mouth. When I was young, thrice I've seen people who were learning speed skating, they got a brain concussion after falling down, foams forming in their mouth, hands were shaking, trying to hold on to anything. Perhaps my condition was the similar to them (in the ambulance?). In the hospital, I was told that my blood pressure shot up that moment. That day (when he visited the restaurant) I ordered only for a Level 3 jjambbong but the ahjeossi gave me the Level 5 soup as a service too. After drinking that soup I collapsed. Perhaps they've made it even spicier than Level 5 spiciness because (I'm) an entertainer. KHJ: I'd do give concert tickets (to my family) but they have to buy the CD albums themselves. I did think of it(SS501 reunion) but I know it's hard in reality. I'm afraid I might say something without much effort & create unreasonable waiting hopes for fans. HJ: I want to build a pension in Jeju Island. I will also set up a scuba shop, but truthfully I don't think I will make money with scuba diving. I don't want to sound like an environmentalist, but while scuba diving, I found that the surface of the sea is really pretty but the inside is very dirty. Makgeolli (rice wine) bottles in the fishing net, beer cans, and many other things. Even if you want to pick them all up you can't. In the future, I want to make a good tradition by gathering other people who also like scuba diving to clean up the sea together. If there is no fish I will also set up fish shelters. Corals are known as the slowest-growing organism, to grow up to the size of a palm around 20 cm will take 20 years to grow. I will take out things that people throw in and got caught in the net, but it would be great to prevent those things getting inside the sea beforehand instead.